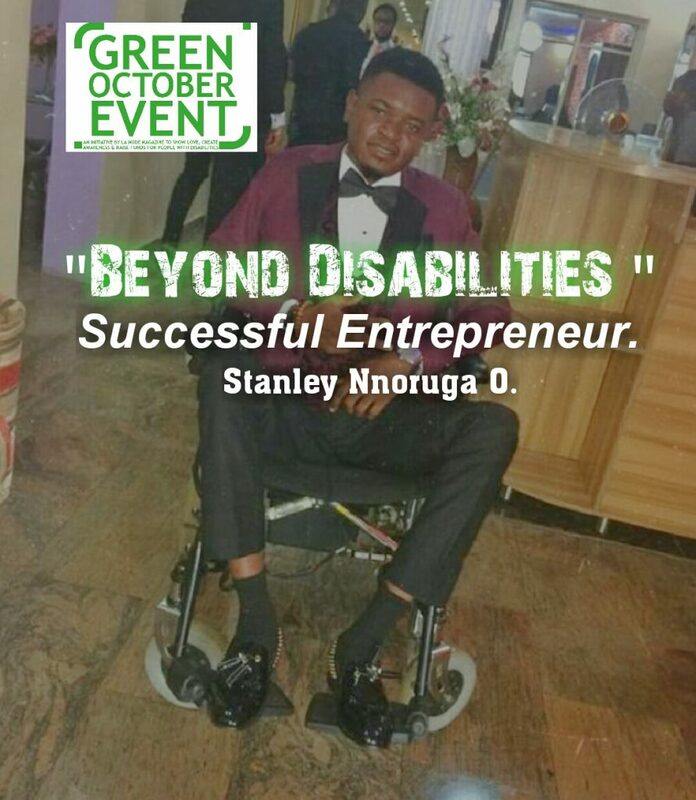 “Beyond Disabilities” Green October Event 2018!Meet Stanley Nnoruga O. Meet Stanley Nnoruga the Chief Executive Officer of Stanzo3 Collections, a fashion importation company based in Lagos. Confined to the wheelchair as a teenager, he has proved that there is ability in disability and managed to fulfill his childhood dreams despite his disability. He was born and raised like every other normal child in the society. At the time of his birth and several years after then, he had no disability. But it was around 2003 while in secondary school that he began experiencing difficulty in moving my legs. It was a painful transition for him because his life completely changed. But because the situation wasn not as bad then as it is now, he had no problem going on with his education. He graduated from the university in 2012 and proceeded for his National Youth Service Corps Programme the following year. He wanted to be a mechanical engineer but after he lost his ability to walk, he had a rethink and decided on going for a computer-related course. This choice was based on the fact that he needed a career path where he will not encounter too much difficulty as a result of his disability. He wanted something he could sit at home and do, that was the reason why he decided on doing e-commerce.. He is grateful to God today that decision had paid off. He always wanted a business he could do right from his room and make good cash as a result of his disability. He came into the business in 2012 after graduating from the Anambra State University. He realised that with his condition, working for someone else would throw a lot of challenges on his path and make his life more difficult. “There are hardly facilities in our society for people living with disabilities, this and other factors I considered before arriving at my decision. And today am now a successful entrepreneur… I have expanded my business”. Meet Estelle Aleonoye August Fashion Icon Winner!